The first and only Pentium-M SFF barebones system. AOpen continues with its desktop P-M venture. Great reading! As usual with SFF's, there's always somthing that's missing or is too loud out of the box. I guess you've already seen the SFF-cut-in-half MZ 855, I wonder if that one got an external PSU. Anyway, you need half height expansion cards for it (if it got any slots at all), and a notebook DVD. A good read but I'm afraid the review is almost as emasculated as the SilentBIOS fan control system. You're excused because, as you say, Aopen's website is so badly designed (and in need of regular updates, I might add), but right here you would have found a precious little utility (motherboards --> i855GMEm-LFS) that combines SilentTek, SpeedStep, easy overclock and the reason for the emasculated BIOS fan control, all in one! I hope you can give us a review update in the near future. The new Revision 'E' A64s use strained silicon, I believe. As seen with Prescott chips, this allows more current leakage, hence the higher temperature of the chip. However, it also allows the chips to run at lower voltages. At least, this appears to be the gist of things if what I've read in various locations is true! We might excuse your attitude if you turn out to be right. Not only did we scour the AOpen site but we were in frequent contact with AOpen's US office by email and phone to find a hw monitoring system that would work. The SilenTek / HW Monitor utility you refer to supports the AOpen mATX 855 motherboard reviewed by Ralf Hutter some weeks ago. It does NOT support our 855 SFF sample, which does not use the same board. Practically speaking, there's just no thermal issue in this system. At no point did even warm air exhaust from either the PSU or the CPU fan vent. Well thanks for the info!! Do you think the heatsink could be replaced with a better tower cooler? Between this and removing the PSU for a passive DC-DC converter, you could have a new silent SFF champion. 28W at idle? Awesome! One might get the mainboard and plug a fanless mini-itx psu on it. That should make a very handy server. Yeah, the Aopen site is very bad - couln'd find any product information about it and the design is far from logic. Regarding the utilities... The integrated Windows XP power management might work with these boards. SpeedSwitchXP offers a way to control this. And tomshardware.com in it's usual fashion reports about a "still unnamed utility" without giving any sources. I also stumbled over a program called "centrino hardware control"
I use SpeedSwitchXP on my Thinkpad T40 laptop with a PM 1.4. I am happy with the application. The utility shown on THG looks like a Chinese version of SilenTek, but even searching on the Chinese language version of AOpen's site, I could not find it. Sunny, AOpenUSA's intrepid customer engineer, did not have info on this either. In any case, CrystalCPUID works fine on the thing. I never did really like AOpen's Windows fan control utility much; their SilentBIOS, in its more flexible versions, is far superior. SpeedFan is probably worth a go for fan control, although it's the PSU fan that needs taming, not the CPU fan. I apologize if I hurt any feelings here, but there wasn't any intention on my part to do so (next time I'll use the Smilies). I am glad to read that you tried the utility I mentioned. It was clear to me that the utility existed because I had also read the Tom's Hardware review. The utility shown on THG looks like a Chinese version of SilenTek, but even searching on the Chinese language version of AOpen's site, I could not find it. Ok, I'm not totally sure what you're looking for, but I think it is the Intel 855Gme Series Tool, right? I started the installation and a yellow window popped up with that M in the background, looks like the pics from THG. Since I don't have a PM I cannot say that it's working, maybe worth a try though. bad power supply. 'tis a shame there's no P-M Zen..
Would replacing the PSU with one of these laptop PSU kits work? The most powerful of our silent PSU kits. Suitable for powering all Mini-ITX boards, including the Insight P4 ITX. The DC-DC Converter can be fitted in the wee-est of crannies. 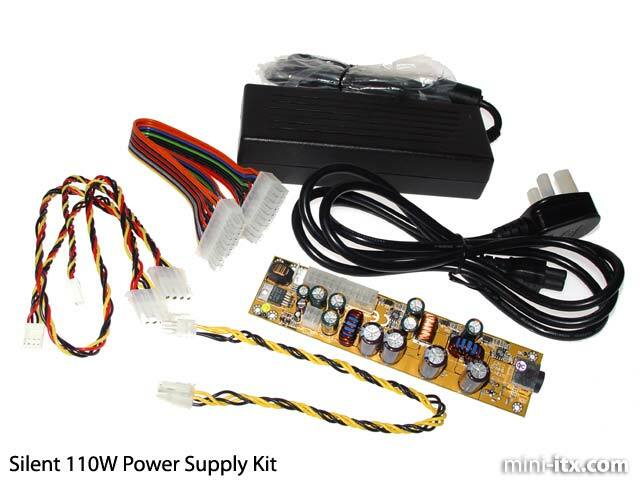 Universal 110-240V PSU, DC-DC Converter board and 17.2V connector, ATX power connector and wiring loom. The most powerful of our silent PSU kits. Does this mean you represent this vendor in some way? Are you aware that as a vendor, we ask that you register before posting? That was just copied and pasted from their website. Sorry I didn't even take note of how they were advertising. I having nothing to do with them. All I wanted to know if an external brick type PSU would work. PassiveMan -- Thanks for the clarification, sorry, no offense intended. Everyone wants to know when it's a vendor that posts info, for many good reasons. I never tried ofcourse, but I don't see why it wouldn't work. Suitable for powering all Mini-ITX boards, including the Insight P4 ITX. The Insight P4 mobo with a P4 Northwood proc would draw more power than the reviewed barebone. You'll need the $3.95 P4-ATX option. After checking my power draw (40-50W), I opted for the 60 Watt supply because the 110 Watt one has a fan inside the brick. Also needed is a 20 pin atx extension cable - but mine came from a differnent vendor because it needs to be pretty long. My machine is much quieter now that the power supply's fan is out of the computer. Now if I can just find any utility to control the processor fan! Nothing above works for me, and my unit didn't come with any SilentTek software. Does anyone have a copy compatible with EY855 they can send me or maybe a pointer to something else (like the still unnamed utility above) floating around I could use? If all else fails, I might try a fanless heatsink on the processor. SpeedFan works fine to probe the temp (but not control the fans), so I can keep an eye on the heat situation. BUT: When CPU RPM <2000 THEN ---- ALARM!!!! Alos: Exchanged the PSU rear-fan with a 80x80x25mm Nexus fan (17.3 dB adv.) .. had to mount it on the backside, but looks good (and hardly any noise). Hopeing for replyes... Esp. courious to how to make the alarm shut up (no speakers inside --- if there were I'd cut 'em of!!!). Removed the buzzer manually - now I can set the CPU fan as I please!